Q: Can you guarantee my chain will never come off? A: Almost! When combined with a clutch-type derailleur, chain-drop will not be an issue for most riders. Q: What chains will Narrow-Wide chainrings work with? A: Any 10, 11 or 12 speed chain will work. We always recommend a clutch-type rear derailleur for the best chain retention. However for general riding without a clutch type drops are very rare given a properly sized chain. Q: Can I use Narrow-Wide chainrings with a front derailleur? A: Narrow-Wide chainrings will NOT allow shifting with a front derailleur as they are specifically designed to stop the chain moving off the chainring to another cog. Q: What is an optimal chainline for 1x? A: 49-50mm is centered on the cassette and that is optimal for a rider that used the whole range of the cassette in a normal distribution. 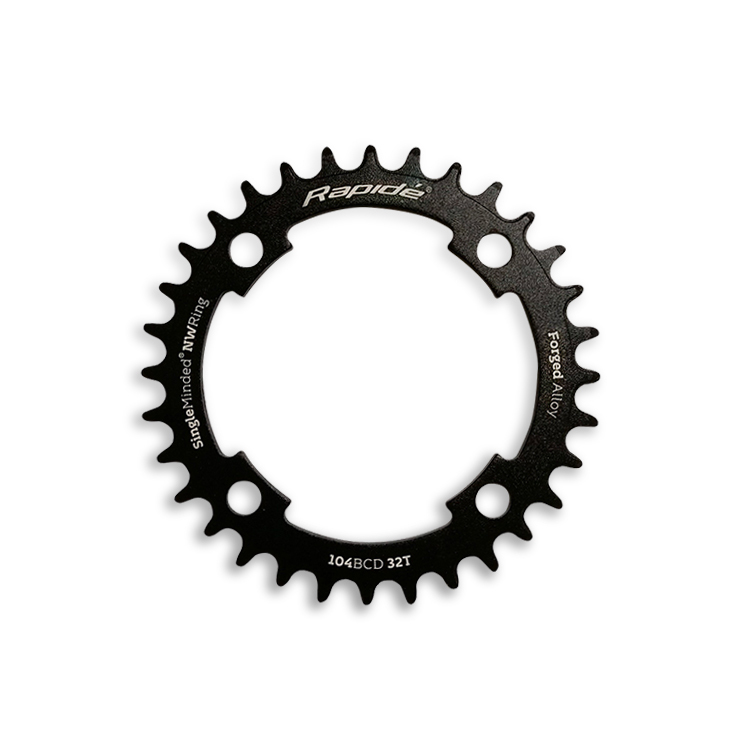 Q: Can I use a Narrow-Wide chainring on my single speed? A: Yes, they work just fine for single speed but have no advantage over a "normal" chainring unless you are using a tensioner in place of the rear derailleur. Q: What bolts should I use for 1x chainrings? A: You can use single chainring bolts of around 5mm depth or for best performance double chainring bolts with our spacers will give an optimum chain line. Our 30t round and 32t oval narrow-wide chainrings have built in spacers and are threaded, you only need the threaded portion of your existing chainring bolt for these. 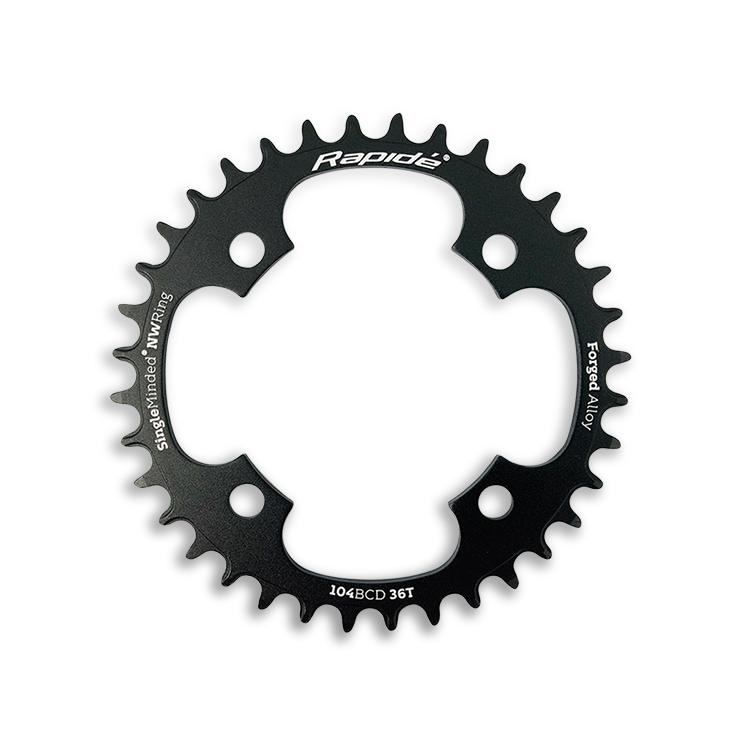 Q: How do I determine what BCD chainring I need? A: Often the BCD is printed or engraved somewhere on the original chainring. If not you will have to measure the distance between the bolts across the center of the cranks. Our chainrings have a 104mm BCD which is the most common size. Always check first as there are several brands of cranks around that have different BCDs on the same model depending on the chainring ratios. Converted my son’s Kona Shred (2006) to single speed, needed to change gearing so ordered 32t version. Looks good on bike, performs perfectly and price was top. Service awesome! Great product at a great price! Durability of the 34T ring has been brilliant, you really can’t go wrong with this if you’re looking for a 104BCD NW ring. Top notch service from Rapide as well. Purchased a 32T NW for my 3x to 1×10 conversion and very impressed with the quality. Fantastic value for money and excellent service too. I would definitely recommend Rapide anytime.